The Vienna remains to be one of the most popular and best value models on the market. Colors: Anthracite (dark metallic gray). Power: 1250 watts - 120 volts. Made in Italy, this 1,250-watt machine eliminates the fuss of creating espresso and espresso drinks at home by automating the entire process. With the push of a button, the machine grinds coffee beans without burning them, tamps the ground coffee into the brew group, brews a cup of espresso, and then dumps the spent grounds into a container--all in about 30 seconds. 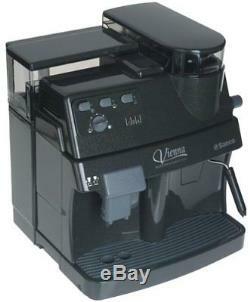 For creating a cappuccino or latte, there's a hot water/steam wand with a milk-frothing attachment. With this model, there's a 35-second delay from brewing to steaming, and 15 seconds from steaming to brewing. A button selects one or two cups, and a knob adjusts cup size up to 10 ounces. For safety, the machine shuts off if the grinder runs out of beans or the water tank is empty (control-panel lights indicate specific problems). The machine measures 15 inches high, 13 inches wide, and 13 inches deep; weighs 19 pounds; and, with a gleaming, marble-gray plastic exterior, looks great on the counter. The bean hopper holds about 12-1/2 ounces (8.8 ounces of espresso beans are included), the removable, transparent water tank holds 57 ounces, and the grinder adjusts from fine to coarse. For cleanup, parts remove easily. 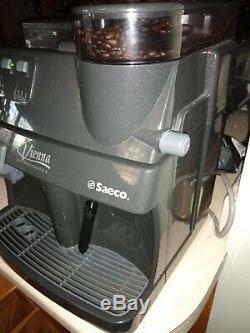 Saeco's Vienna will grind, dose, tamp, brew, and dispense exceptional quality coffee. Prepare a true espresso topped with a thick golden crema, a larger cup of aromatic regular coffee, and froth milk for your favorite latte drinks. This fully automated coffee machine has the capability to deliver, in one cycle, one or two cups of coffee, from one to eight ounces in size. Prepare perfect cappuccino and latte drinks with its powerful steam wand and our exclusive Pannarello frothing device. 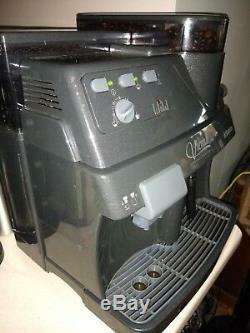 Make all your favorite coffee drinks with ease and constant high quality! The brew group is where your coffee is tamped, brewed, and dispensed. The patented brew group can be taken out for convenient rinsing. The brew group compartment is completely separated from the electrical compartment, fully accessible, and can easily be kept hygienically clean. That is proprietary Saeco technology and one of the things that has made Saeco world leader in superautomatic coffee machines. To optimize the flavor extraction, a special program step injects a little hot water into the freshly ground coffee, in order to soak it and let it swell up. This is done just before the actual brew cycle commences. Opti-Dose--adjustable dose of ground coffee per serving: 0.25 ounces/7 grams. Capacity of the bean hopper: 12.35 ounces/350 grams. Capacity of the dump box: 15. Manual adjustment of level of coffee per cup. Ability to prepare 1-2 cups at the same time. Saeco Aroma System pre-infusion system. Pump pressure approximately: 15 bar/200 psi. Hot water for tea and other beverages. Automatic disposal of used coffee grounds. Easy Clean System accessible brewing compartment; removable brew group. Measures 13 by 15 by 13 inches. 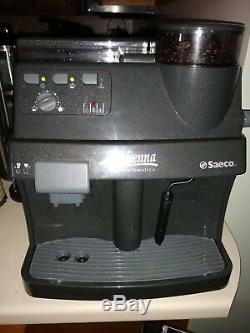 The item "Saeco Vienna Superautomatica Espresso, Coffee, and Cappuccino machine" is in sale since Saturday, January 12, 2019. This item is in the category "Home & Garden\Kitchen, Dining & Bar\Small Kitchen Appliances\Coffee, Tea & Espresso Makers\Espresso & Cappuccino Machines". The seller is "kwic2643" and is located in Asheville, North Carolina. This item can be shipped to United States.